Use in both the interior and exterior. Rust resistant. Use in both the interior and exterior. Rust resistant. Offset screw holes for extra strength and to prevent wood from splitting. Tight pin for left or right hand applications. Steel with aluminum pin. Safe working load: 18 lbs. Boxed loose. Use in both the interior and exterior. Rust resistant. Offset screw holes for extra strength and to prevent wood from splitting. Tight pin for left or right hand applications. Steel with aluminum pin. Safe working load: 18 lbs. Boxed loose. Use in both the interior and exterior. Rust resistant. Reinforces doors, gates and sheds. Offset screw holes for extra strength and to prevent wood from splitting. Tight pin for left or right hand applications. Steel with aluminum pin. Safe working load: 18 lbs. Boxed loose. Reinforces doors, gates and sheds. Reinforces doors, gates and sheds. Use to move light to medium weight furniture. Hard plastic wheels. Reinforces doors, gates and sheds. Offset screw holes for extra strength and to prevent wood from splitting. Tight pin for left or right hand applications. Manufactured with hot-rolled steel. Reinforces doors, gates and sheds. Offset screw holes for extra strength and to prevent wood from splitting. Tight pin for left or right hand applications. Manufactured with hot-rolled steel. 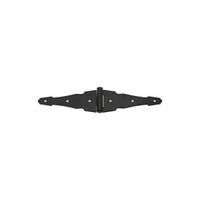 National Hardware Strap Hinge, Decorative, Heavy Duty, Ornamental, Series: V847, 6 in Overall Length, Steel, Black, Zinc Plated, BHMA A138.18 Reinforces doors, gates and sheds.